I've tried baking many many MANY mud cake and chocolate cake recipes over the years, recipes from scratch, recipes using boxed packets, recipes others recommended on the internet and FINALLY have found what I feel is the perfect, super thick, moist, delicious chocolate mud cake recipe EVER. It always works (even if you don't measure the ingredients perfectly), and you can simply double it if you want to do a huge tin. 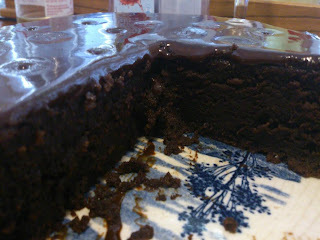 It is extra especially delicious if you make the chocolate ganache to go on top! Basically if you see chocolate on sale - buy two blocks and you can make this with the icing. Soooooo good, your friends and family will be begging you to bring it to events. AND you will never want to buy another mud cake again because you will have this SECRET recipe! 2. In a saucepan, melt the butter, chocolate and coffee over low heat, stirring, until the chocolate has dissolved. 3. Add the sugar to the pot and stir it in until it has dissolved too. 4. Pour the mixture into a heat-proof bowl. 5. Sift the flour, cocoa and baking powder over the top and whisk them into the liquid then whisk in the eggs then the vanilla. 6. Once everything is combined, pour the batter into the cake tin. 7. Bake the cake for 1 hour or until a cake tester inserted in the middle comes out clean. 8. Leave the cake to cool completely in the tin. 1. Place chocolate and cream in a small saucepan over low heat. 2. Stir until melted and glossy. 3. Refrigerate until cool (or pour over your cake when it's just a little bit cooler - I usually do this because I can't be bothered waiting and it makes a really beautiful glossy smooth coating). I will definitely try this tomorrow and will repost the outcome, thank you for the recipie . Sounds like a great recipe. What cake tin size did you use? I need to make a 10' cake. Will this recipe be enough? I haven't tried it yet but I can tell this is going to rock anyways. yes, just instant nescafe coffee. as the water heats on the stove it all melts together.